Once a vinegary, purple pariah, beetroot has recently reclaimed its rightful place on seasonal British menus. A root vegetable that is valued for its vibrant colour, firm flesh and sweet, earthy flavour, it is an incredibly versatile ingredient with many nutritional merits too. In Britain, beetroot is available from June to March but is at its sweetest during the growing season from late June to October (pre-cooked beetroot is available all year round but fresh beetroot has a better texture and flavour). As well as the traditional purple kind, there are golden, white and pink-and-white-striped heirloom varieties which taste as delicious as they look. And beetroot isn’t just a savoury ingredient: the flesh can be used to enrich cakes, to make refreshing sorbets and to add an earthy sweetness to juices. With so many ways of serving this humble vegetable, beetroot-haters might have to give it a second chance. When buying fresh beetroot, look for firm beets with smooth, un-damaged skin and a diameter of no more than 6–7cm – any larger than this can indicate a tough, woody core. 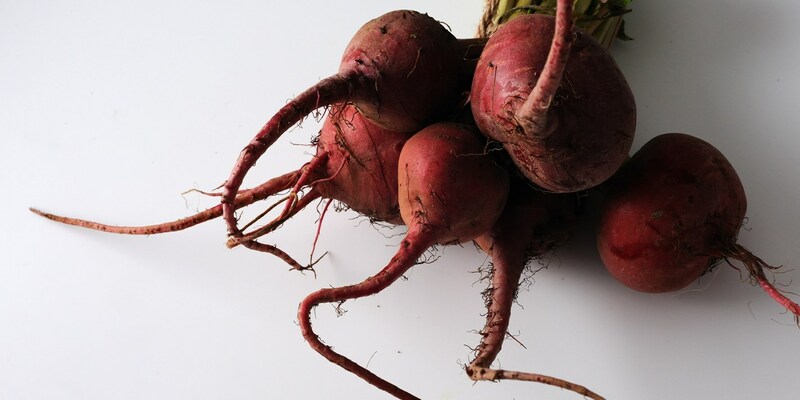 Try to pick beetroots of similar sizes so they cook evenly. If possible, buy beetroot with the leaves and roots still attached. The leaves should be fresh-looking and not wilted and the tap root should be firm. Remove the leaves to store but leave the root in place. The leaves can then be used in exactly the same way as chard or spinach and should be cooked within one to two days of purchase while the beets can be kept in the fridge for up to two weeks. The most common ways to cook fresh beetroot are to roast or boil it whole. Raw beets can also be peeled and grated into salads or juiced with other vegetables for a highly nutritious drink. Before cooking, cut the stems and roots from the beetroot leaving approximately 2.5cm in place; if either of them are trimmed too much, the colour will bleed out while cooking. Wash the beets thoroughly being careful not to tear the skin and cook as per instructions. The best way to tell whether beetroot is cooked is to insert a sharp knife into the flesh – it should slide in easily. When cool enough to handle, remove the skin by rubbing it gently with your fingers. If you want to avoid staining your fingers, wear rubber gloves or clean them with lemon juice afterwards. Beetroot is extremely versatile but its earthy sweetness pairs particularly well with smoked fish, goat’s cheese, blue cheese, steak, duck and game such as pigeon, grouse and venison. Use beetroot in simple salads and soups or as a stunning side dish. Due to its natural affinity with vinegar, beetroot chutney is a cracking, sharp but sweet accompaniment to cheese, cold meats and pork pies as well as turkey and salmon burgers. Or try Marcello Tully’s recipe for beetroot bread that looks as gorgeous as it tastes. And for pudding, combine it with chocolate in rich cakes or with lemon in palate-cleansing sorbets or for something even more unexpected, try pairing it with bubblegum for David Everitt-Mathias’s incredible petit four.